WHF and its members believe that there is no equity and human rights without health justice and heart health for everyone. Regardless of country, region, origin, race, gender, age, education and revenues, each human being is entitled to cardiovascular health and well-being through health promotion, access to prevention, control and management of cardiovascular disease. to stimulate and catalyze the exchange of information, ideas, practices across all borders, to achieve heart health for everyone, everywhere. 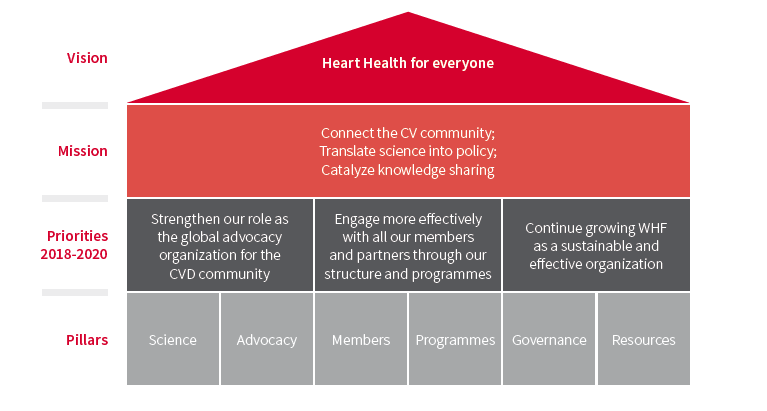 The vision and mission are built on five key global roles of WHF: (i) advocacy; (ii) science; (iii) capacity building; (iv) implementation and health system strengthening; and (v) building a civil society movement for access to cardiovascular health through WHF’s international leadership, member engagement at global, regional and national levels, and communication to our professions, patients and the public. We have also identified three strategic priorities have been identified for the period 2018-20 as the fundamentals of success: Leadership in advocacy; Engagement with our members; and a Sustainable organization.